Whether your a single parent by choice or chance, there's levels to this! Single parents are like super heroes, the hail you and they will nail you, so always make sure you DO you and love self first. Have a positive outlook on life - This step applies to anyone in any situation. As a single parent you will encounter many challenges, struggles, and joys. Facing and going through these experiences might change your outlook on life, either in a positive or a negative way. Keeping a positive attitude is key in becoming a successful single parent. Be patient - patience is the number one rule when it comes to kids. Don’t worry about the little things like dirty hands or dishes; you will get to them. You want to be able to spend all the time you can with your child/ren playing, teaching and learning in a positive setting. These steps I have taken and continue to take as a single parent. Single on financial matters and all responsibility of the child. So working is a must and time is more than money. I have so many other responsibilities and I feel guilty for the time it takes. I will update you on my story, I hope you share yours in the comment box below. WORK & PLAY CAN IT BE DONE? Being a working single mother it is very important to balance your life with work and play. It's a must that you create cash flow and stay above bills so work in definitely about of the equation. Now play, it can be so many things, a hobby, social events, basically things you enjoy before becoming a parent. These things make you happy you have to fit them in so you don't lose yourself. Work on a scrapbook, write a play, get dancing lessons. Just do something that makes you feel good too. Our children watch us and the environment we place them in will influence their growth. As I always say happy moms make happy babies. Be happy !!!! This Christmas has been a great one spending it with family and friends is whats important. despite my crazy work hours I found time to bring Christmas to my baby with the help of my sisters. We have been sharing memories and cooking great meals together.Taking on creative projects, making music and working with fashion. The closing of this year is allowing me to settling into the success and amazing projects to come in the upcoming year. Christmas time is always the time of the year where I get everything in order and get ready for the new year with new ideas and goals. I mean thats my everyday routine however Christmas time its extra special. So much adventures to come this new year 2014. I'm ready for change and glory. Right now I'm finishing up dinner and getting ready to take my little girl to see her grandpa and great aunt. I got everything I wanted this Christmas and this year! MERRY CHIRSTMAS TO YOU ALL AND GOD BLESS!!! This time of year always excites me. The change in weather, the new winter styles, the spending of money and the earning of it. I especially love the holiday cheer. It's the best time of the year. This year for thanksgiving I plan on having everyone make a dish and trim the tree after dinner. What a way to get into the holiday spirit and burn off calories right?! I plan on finishing my shopping by the end of the month. Once I get all my Christmas shopping done I can focus on my baby's birthday bash!!! She's be three this new year. As the year comes to a close and everyone is getting ready to celebrate the new year, I will be be preparing to throw the best party since last year lol. Last year thanksgiving was great I visited a few people I have a feeling it will be pretty busy this year since I have many houses to stop at. Her Christmas was very nice as well! Her birthday party tho was awesome we did Yo Gabba Gabba! This year we will be bringing Strawberry Shortcake to an indoor playground called Billy Bees. I'm SOOO excited and I'm getting a great deal on the party as well!! Best of all I don't have to clean up after!!! Yay! What are your plans for the remainder of the year? And who will you be spending it with? Be happy & Know your blessed. I love going out and enjoying my day with Nevaeh, she's the best hang out buddy when she wants to be. We both love hitting the road and being free. What makes it extra sweet is saving money! As a single mom depending on my own income I am drunk with joy when saving a few dollars. Groupon helps me do both! Have fun and save money. Just Checking out their deals is an adventure. You always find something you need or even better, something new to do. I just picked up a few extra bucks so I checked out a few deals. NEVAEH is gonna love love love when we hit the Bounce! And so am I! Lol. This deal is a good one too, looks like great fun for the kiddies. They even have swimming lessons! How was your Labor Day weekend? I rarely make plays for Labor Day it's one of the holidays that gets pass me. This year I just got out and did everything I wanted to do. I always wanted to regularly ride on a yacht with my closet friends and family just having a good time. Friday night that dream came true for the first time. I went out with my sisters and cousins and enjoyed music and drinks and more. A night I will always remember. I have to somehow find a way to make yacht riding a regular thing for me lol. 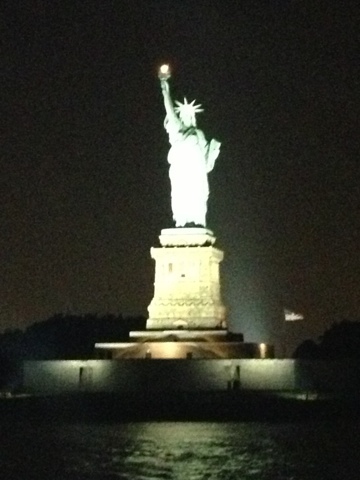 We rode the Hudson and took notice of how beautiful New York City is at night. One of my clearest shots lol. Isn't she lovely? That's all of us that night. 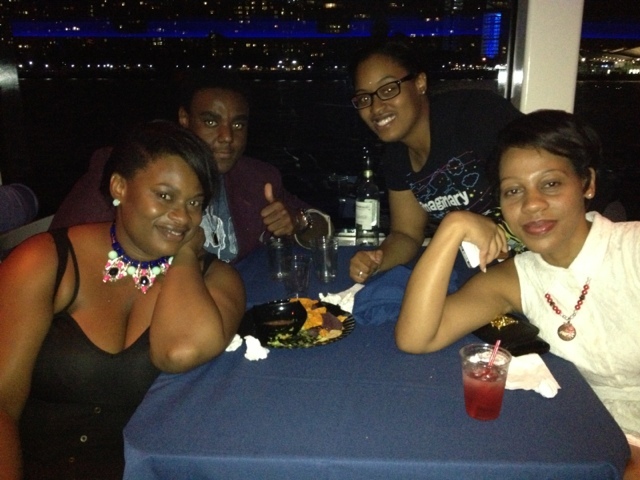 Me, Chesler friend of the fam ,Yanni my sister and Tosh my best cousin. We had a ball. Saturday was a quiet day. Real peaceful and laid back for me and Nevaeh we just played and worked on fun projects and watched TV. Sunday we were back to business. We booked a photo shoot for the jewelry line and had a great time taking pictures. I have a feeling the photos came out great! Here are some photos of the shoot. The best gadget today is the handy cellphone. We carry it every day. Some of us can’t live without it. There is nothing better than having a trust phone around. There are many uses of this gadget. The most obvious is for communications. Nowadays phones are advance. It doesn’t only make us call but it can do other things like sending text messages, reading emails among others. Aside from communication, it can entertain us. We can download songs and play games. You can also find phones with navigating power. The most important benefit of phones is helping us to save money. 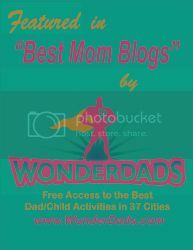 As a mother, it is not about getting free minutes, sending free messages and connecting to the net for free. You can find mobile phone applications that you can download and install on your phone so you can get the best deals around. There are many types of app phones available. Aside from helping you to save money or organize your finances, it is best to explore some of them. They are worth it so that your hard earn money can go a long way. · You can download an app in your mobile phone that will serve as your guide when want to have savings. Every time you avail items, you can earn points that are redeemable. It is so much fun to receive gift cards. Shopkick is an app that can let you shop and avail discounts. · There is an app that will help you organized your bills. It is called Bill Assistant. You can get a notification when the due date of the bill is approaching. Some moms are busy and for this reason they want to be notified right away when they need to pay bills. It will prevent anyone from paying late fees. · Are you a heavy internet user? You can find an app that will help you save money with free internet.. There is an application called Cloud. This app helps you localte wi-fi in your area and connect you to free internet right away. There are hotspots everywhere. Imagine you can save a lot of money for just using free internet. · You can find an app will let you collect coupons from everywhere. It’s called Snip Snap. You can just snap the photo, scan and then save. You can show this at a select store and avail this promo. There are thousands of coupons that you can find. An example is boost mobile coupons are the best way to save on Boost Mobile phones. This is a way to save money on huge purchases. Copyright © Pacifiers & Lip Gloss. All rights reserved.